The OM5 represents a major departure from classic office chair design. Two years of work with a forward-thinking design team resulted in an elegant solution to the adjustable chair. The rollers in the OM5 allows “body-activated movement” as the chair shifts to conform to a seated worker’s body position. The result is almost completely lever-free, but still supremely adjustable. A great choice for those tired of carefully fine-tuning a chair to the right spot. Passive adjustment takes the effort out of finding a comfortable position – the OM5 automatically conforms to changes in a user’s posture. Futuristic styling makes for a much more fashionable chair than Officemaster’s pragmatic norm. 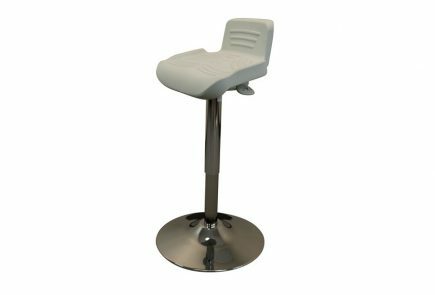 Some heavier users will find that the chair reclines a little too readily, making it difficult to hold a slight backward lean. Skateboards aren’t quite the first place we’d look to for inspiration if we were designing an office chair, but we’re clearly not Francisco Romero. Romero, who began his career under Don Chadwick (the celebrated designer of the Aeron chair), took a cue from the smooth, sliding motion of a skateboard while working on the OM5’s passive adjustment system. Two rollers in the chair, one under the seat and one in the “shark fin” on the chair’s back, allow a smooth, gliding adjustment to a reclining user’s body. While other chairs generally rely on a forest of knobs and levers to adjust – the complex-but-equally-brilliant Officemaster Discovery‘s array of precision options comes to mind – the OM5’s underside is nearly empty. Only a height adjustment lever is present, and yet the chair remains fully ergonomic. 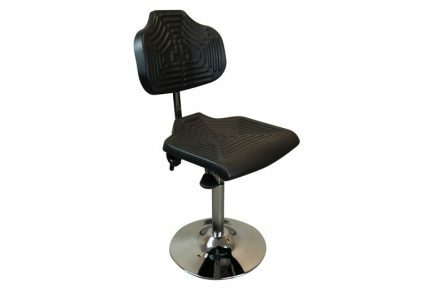 Instead of twiddling with the baffling array of controls found on an active adjustment chair, the OM5 is adjusted by the user’s own body movement. Pressing slightly against the back of the chair will prompt it to recline with you, sit upright and the chair will move back to its original position. The other adjustable portions of the chair – the arms and the seat pan – are also intuitive. Small locks on the side of the arms can be disengaged if a user wants to vertically adjust his armrests, a good idea for ensuring proper upper-body ergonomics. The front of the seat pan can also be pulled out to create a flat, longer pan, or it can be curled down to create a smaller pan with a more rounded, “waterfall” front. This adjustment is a simple matter of pushing or pulling on the front of the seat pan, and helps a user either support their legs, or reduce pressure on the back of their knees and upper calves. Passive adjustment does come with a couple of downsides. Some users will find it difficult to “hover” in one intermediate position, as even a small amount of pressure on a partially reclined OM5 will prompt it to continue its descent. Larger individuals in particular may find themselves popping backwards a little more easily than they’d like. Others will simply dislike the lack of active control over a chair’s position. However, passive adjustment has its charms as well. Testers at the WorkWhileWalking office have found the OM5 to be an incredibly comfortable alternative to active-adjust chairs, and for most it was an excellent balance of support and convenience. The OM5 also takes the guesswork out of ergonomically adjusting an office chair. Many users of active-adjust chairs do themselves the disservice of improperly setting up their seat. Choice isn’t always ideal, and what seems like a comfortable position at first might be a subtle back-tweaker over the course of a workday. Instead of the user adapting their body to the OM5, the OM5 adapts itself to the user – a design philosophy that we can appreciate here. As a result, the chair makes an enormous amount of sense for use in any shared workspace. Instead of having to make time-consuming fixes to a chair set up for a coworker – or just skipping that phase and making the best of a bad seat – a user only has to sit in the OM5 and let the chair do the rest of the work. Function, but What about Form? Good news for the aesthetically picky: the OM5 is a looker. We’ve reviewed other Officemaster chairs, and while their functionality is undeniably through the roof, they haven’t approached the design flair of names such as Herman Miller or Steelcase. The OM5 definitely changes that. Skeletal lines and smooth contours give the chair a futuristic feel, and upscale office owners should be pleased at how well it fits into fancier surroundings. Testers also appreciated the waterfall seat, which we found comfortable but not cushy or deep enough to present posture risks. 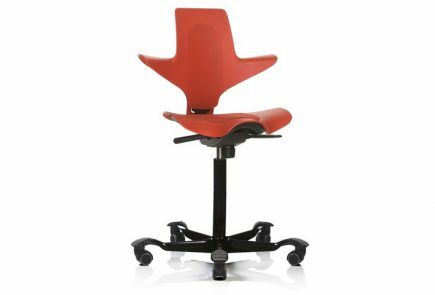 Officemaster also offers a range of color and upholstery options for the OM5. The PolyFlex back (plastic, when all’s said and done) comes in white, black, and grey, with an XL option for larger users. Those who dislike the look or feel of plastic can also opt to have it upholstered in thin mesh, which comes with the same color options as the seat. The truly luxurious version comes kitted in leather. The OM5 comes with a limited-lifetime warranty, miles better than the ~7 year coverage normally seen for office chairs.